Saeidnia, S., Sepehrizadeh, Z., Gohari, A., Amin, G., Manayi, A., Hadjiakhoondi, A. (2014). Monoterpene synthase from Dracocephalum kotschyi and SPME-GC-MS analysis of its aroma profile. Research Journal of Pharmacognosy, 1(2), 11-21. S. Saeidnia; Z. Sepehrizadeh; A.R. Gohari; G. Amin; A. Manayi; A. Hadjiakhoondi. "Monoterpene synthase from Dracocephalum kotschyi and SPME-GC-MS analysis of its aroma profile". 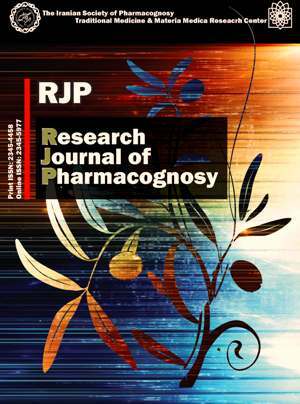 Research Journal of Pharmacognosy, 1, 2, 2014, 11-21. Saeidnia, S., Sepehrizadeh, Z., Gohari, A., Amin, G., Manayi, A., Hadjiakhoondi, A. (2014). 'Monoterpene synthase from Dracocephalum kotschyi and SPME-GC-MS analysis of its aroma profile', Research Journal of Pharmacognosy, 1(2), pp. 11-21. Saeidnia, S., Sepehrizadeh, Z., Gohari, A., Amin, G., Manayi, A., Hadjiakhoondi, A. Monoterpene synthase from Dracocephalum kotschyi and SPME-GC-MS analysis of its aroma profile. Research Journal of Pharmacognosy, 2014; 1(2): 11-21. 1Medicinal Plants Research Center, Faculty of Pharmacy, Tehran University of Medical Sciences, Tehran, Iran. 2Department of Pharmaceutical Biotechnology, Faculty of Pharmacy & Biotechnology Research Center, Tehran University of Medical Sciences, Tehran, Iran. 3Medicinal Plants Research Center, Faculty of Pharmacy, Tehran University of Medical Sciences, Tehran, Iran.Department of Pharmacognosy, Faculty of Pharmacy, Tehran University of Medical Sciences, Tehran, Iran. Dracocephalum kotschyi (Lamiaceae), as one of the remarkable aromatic plants, widely grows and also is cultivated in various temperate regions of Iran. There are diverse reports about the composition of the oil of this plant representing limonene derivatives as its major compounds. There is no report on cloning of mono- or sesquiterpene synthases from this plant. In the present study, the aroma profile of D. kotschyi has been extracted and analyzed via Headspace Solid-Phase Microextraction technique coupled with Gas Chromatography- Mass Spectroscopy. In order to determine the sequence of the active terpene synthase in this plant, first mRNA was prepared and cloning was performed by 3’ and 5’-RACEs-PCR method, then cDNA was sequenced and finally aligned with other recognized terpene synthases. The results showed that the plant leaves mainly comprised geranial (37.2%), limonene-10-al (28.5%), limonene (20.1%) and 1,1-dimethoxy decane (14.5%). Sequencing the cDNA cloned from this plant revealed the presence of a monoterpene synthase absolutely similar to limonene synthase, responsible in formation of limonene, terpinolene, camphene and some other cyclic monoterpenes in its young leaves.